Climate-related impacts are expected to intensify significantly in the coming years, deepening struggles for many ‘already’ vulnerable communities. How will the already stretched humanitarian system be able to respond? The global natural environment is in a system-wide crisis, with no end in sight. The future dangers are global, local, and pervasive. Food and water security for communities will be a growing problem beyond any easy local solutions and is anticipated to drive future conflicts.  The commodification of natural resources (e.g. priced access to clean water and land), the impacts of unpredictable rainfall patterns and droughts on agricultural productivity, the increasingly fraught access to energy, and unsustainable waste management are fundamentally changing communities’ ability to live well, to have secure livelihoods, and to weather external shocks. The increasing shift to urban environments is further compounding these challenges and necessitating a change in how development and humanitarian aid is conceived and delivered. Climate change has a direct impact on almost all human societies across the globe and complicates most human endeavours, including disaster response and humanitarian aid. Rising sea levels and desertification, which have both progressed steadily over the past two decades, displace populations and contribute to conflict. There are now 400 extreme weather events every year, four times as many as in 1970. In 2017 alone, climate and weather-related disasters hit nearly every continent, in a seemingly unending spiral. These disasters are significantly compounding vulnerabilities – the complex confluence of severe floods in Bangladesh, as well as the Rohingya population movement the country, and a strained infrastructure is a prime example. Current forecasts predict more of these crises with deeper complexity and severity. 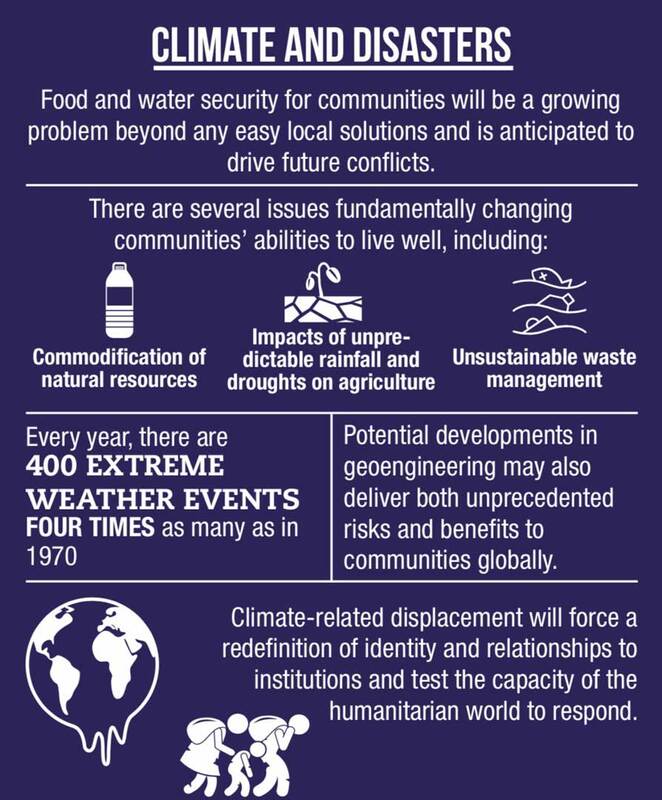 Potential developments in geoengineering may also deliver both unprecedented risks and benefits to communities globally. Climate change-driven migration could increase the threat of conflict as arable land and water become increasingly scarce. Forced displacement is already a development world crisis, with 95 per cent of the world’s refugees and internally displaced people living in poor countries and originating from the same 10 conflicts since 1991. Climate change will act as a threat multiplier, driving more people into poverty and potentially leading to systemic crises. The most vulnerable people with the least resources to adapt -and particularly those living in developing countries in Africa and South Asia – will face the brunt of the impacts of such instability. At end-2017 we saw the island of Barbuda being completely destroyed and rendered uninhabitable due to a hurricane: in the coming decade there will be increased instances of places being unable to sustain communities (particularly those living on coastlines, the edge of drylands, urban floodplains, etc.). Climate related displacement will force a redefinition of identity and relationships to institutions and test the capacity of the humanitarian world to respond. How can we better understand how people, communities, economies and states will respond to and be affected by climate change and natural resource depletion in the future? How do we work with communities on issues of energy access and protection of natural resources? How are we going to manage multiple large-scale crises potentially occurring at the same time, including multi-faceted responses that include innovative partnerships, advocacy and diplomacy and programmatic responses? How will we manage mass climate-related displacement? A pervasive localized network that has retained and grown its volunteer base can mobilize effectively across multiple locations simultaneously. The scale of challenges relating to climate change and resource shortages will require large-scale collaboration and new transformative partnerships with multiple sectors opening up possibilities for new dimensions of response that focus on collective impact. Hi , I’m doing a a project for logistics based on the Red Cross under the humanitarian logistics. I want to use this a my trend for my project , any chance you guys could enable me to more information regarding this point.